The natural beauty of Guatemala’s landscape is rivaled only by the beauty of its people and traditions. This week we’re celebrating one of the country’s most significant holidays, Semana Santa (Holy Week). 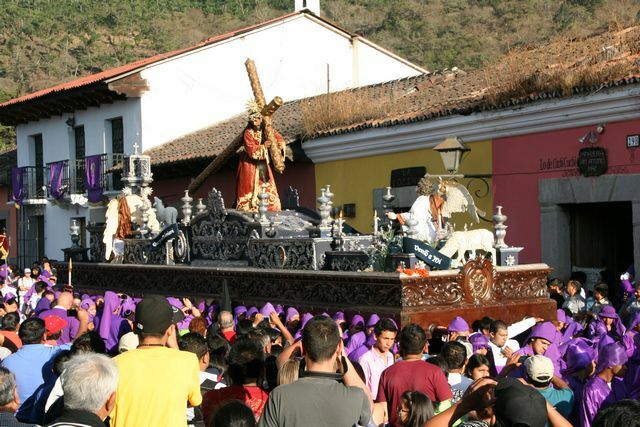 As a country with deep connections to the Catholic Church, Semana Santa represents the faith of many Guatemalans, their heritage, and cultural identity. For more than 500 years, Spanish influence and Catholicism have shaped this beautiful country. Beginning on Ash Wednesday, the Lenten season prepares Catholics for the events of Easter. Semana Santa, the week preceding Easter Sunday, culminates the Lenten season. Preparation and celebrations fill each day of Semana Santa. As a holiday, many businesses and governments close so families can participate in local events. Antigua, the original Guatemalan capital and a UNESCO World Heritage site, hosts the most famous celebration annually. Hundreds of thousands of visitors descend on the historic city to experience the excitement of Semana Santa. During the weeklong celebration, the city transforms into a daily celebration of history, faith, and artistry. Visitors experience daily processions, special services at the city’s historic cathedrals, and get a chance to witness long-held traditions. As a new visitor, each day’s procession will draw you in and hold your attention for hours. Festive marching bands and dance troupes lead each day’s procession. Huge wooden floats, andas, depict the Holy Week story and are carried through the town. For those who are chosen to carry the float, it is a distinct honor. Along the path, families decorate their homes and street vendors sell special treats, adding to the excitement. From afternoon until late night, the procession’s music fills the city. Cheerful music, colorful costumes, and massive floats may catch your attention, but the streets are one of the most spectacular features. The streets of Antigua transform into works of art. Families and businesses whose properties line the procession route spend days planning and hours creating the traditional carpets, alfombras. The artistry of the alfombras is part skill and part soul. For those creating these masterpieces, their designs represent faith, national pride, and creativity. They meticulously layer dyed sawdust using stencils to create intricate designs. Once complete, the alfombras create the path each procession follows. In addition to sawdust, people add flowers, plants, and fruits to create unique designs, commemorating each unique community. Although scattered after the procession, sawdust along the city’s historic cobblestone streets reminds visitors of the city’s ongoing celebration. Semana Santa represents the best of Guatemalan culture, hospitality, faith, and tradition. Encouraging our children’s faith and cultural heritage is important. Although they enjoy a 10 day summer break from school to celebrate Semana Santa, we want this holiday to mean more than fun and games. Each day during Semana Santa, our Special Mothers prepare a devotion to help our children understand the Holy Week story. Their stories help connect the celebrations with the meaning of the season in ways our children understand. As our children mature, we want them to appreciate their Guatemalan heritage and enjoy celebrating traditions together.